Update: Our paper “proCover: Sensory Augmentation of Prosthetic Limbs Using Smart Textile Covers” received the Best Paper Award at UIST 2016! Today’s commercially available prosthetic limbs lack tactile sensation and feedback. Recent research in this domain focuses on sensor technologies designed to be directly embedded into future prostheses. We present a novel concept and prototype of a prosthetic-sensing wearable that offers a noninvasive, self-applicable and customizable approach for the sensory augmentation of present-day and future low to midrange priced lower-limb prosthetics. From consultation with eight lower-limb amputees, we investigated the design space for prosthetic sensing wearables and developed novel interaction methods for dynamic, user-driven creation and mapping of sensing regions on the foot to wearable haptic feedback actuators. Based on a pilot-study with amputees, we assessed the utility of our design in scenarios brought up by the amputees and we summarize our findings to establish future directions for research into using smart textiles for the sensory enhancement of prosthetic limbs. 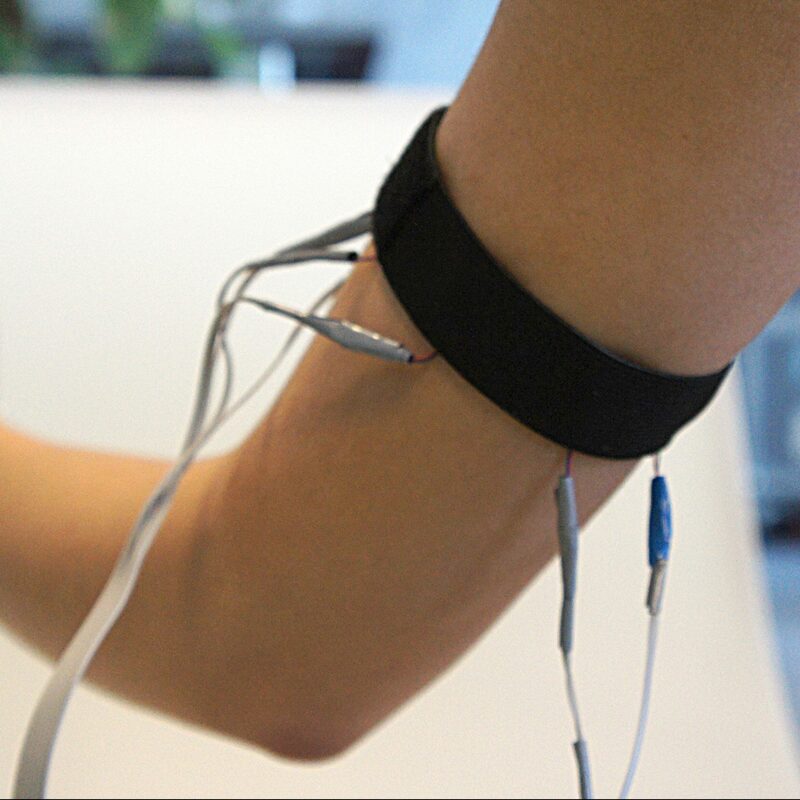 The design and construction of prostheses that can emulate a natural sense of touch is of growing research interest. Over the last few decades, a number of solutions have been developed for the detection of pressure, slip, heat and texture. Many of these are centered upon embedded sensor technologies, with the objective of restoring sensing capabilities for people who have lost a limb and must therefore rely on a prosthesis. However, many of the exciting innovations in this field will likely remain out of reach for most people due to a multitude of factors pertaining to cost, accessibility, health status, and personal attitudes towards elective surgery. 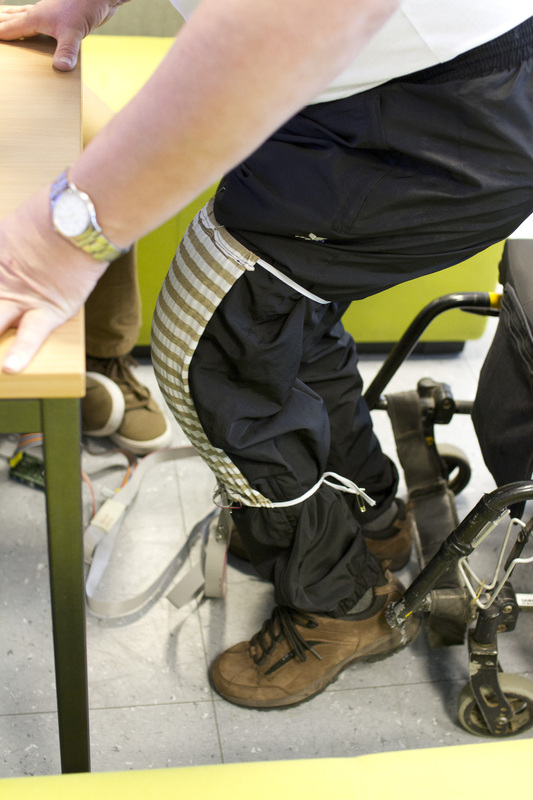 We introduce proCover, a low-cost sensing wearable in the form of a textile sock that can be applied retroactively to lower-limb prosthetics to make sensing capabilities more broadly accessible to those who rely on these assistive devices. The first prototype comprised a sensing sock (made from one layer of piezoresistive fabric sandwiched by two layers of conductive zebra fabric), measurement electronics, and a vibration armband. The sole of the sock was divided into six different sensing regions. Pressure values read from each region were mapped 1:1 with individual actuators in the vibration armband. Pressure values were mapped linearly to the vibration intensity of each motor. In order to design a sensing wearable that would suit the needs of those with prosthetic(s), we interviewed eight lower-limb prosthesis-users (three female) to gain an understanding of their sensing needs and to uncover the possible associated factors such as their amputation-type, attitudes and activities. In analyzing the data, we discovered that our participants generally have a positive outlook on sensory feedback for prosthetic legs, wear socks on a regular basis, and have a preference for shoes that envelop the foot and can be affixed firmly to their feet. In a colouring activity, we asked participants to shade parts of the foot to indicate the importance they give to different regions of the foot for sensing. From this we learned that they have diverse sensing needs that are influenced by factors such as amputation-type as well as the physical activities they partake in. In post-discussions, we furthermore learned that some participants were concerned with knowing the bend-state of their prosthetic leg(s). An iterative approach was taken to designing proCover. In response to lessons learned from the pre-study, the original proCover prototype was enhanced with two new features. In order to address the fact that prosthesis-users have diverse sensing needs, we introduced a novel customization feature that allows personalized sensing regions to be created on the sock in two steps. First, users select a new sensing region by directly applying pressure to the desired sensing area. 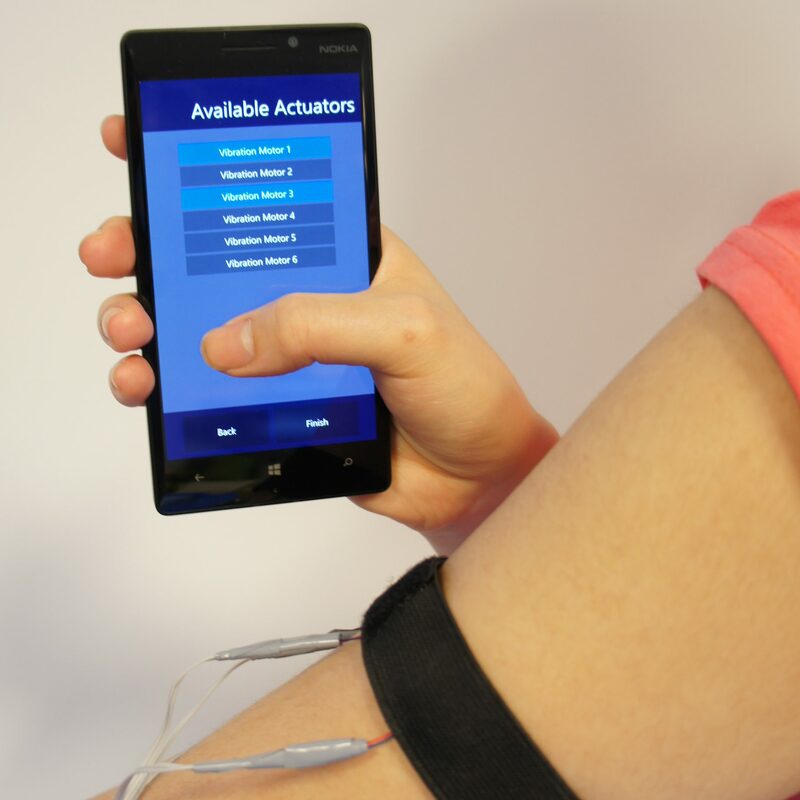 Second, users can then use a mobile app to select actuators in the armband that should vibrate when pressure is applied to the given region. As a second feature in response to the concerns raised in the pre-study, we implemented a sensing knee-guard to investigate the potential of using a smart textile approach to detect bending in prosthetic limbs. 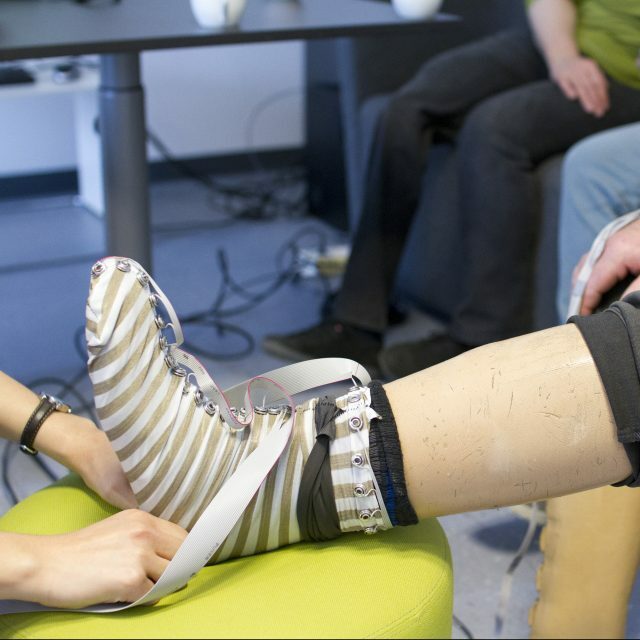 In an in-lab pilot-study, we had four lower-limb prosthesis-users try on the sock and knee-guard to assess their utility in the context of different scenarios participants had brought up during the sensing needs pre-study. The pilot study comprised of three tasks: (1) touch discrimination, (2) pressure discrimination and (3) bend detection. In the touch-discrimination task, participants were asked to identify which part of their foot is being touched as we applied pressure to either the ball or heel of the foot in a random alternating sequence of touches. We compared the participants accuracy for this task and found that the sock offered a significant improvement, reducing the error rate to zero from 75%. In the pressure discrimination task, we had users apply three different degrees of pressure to car-pedals, and compared their accuracy in performing the task with and without the sock. 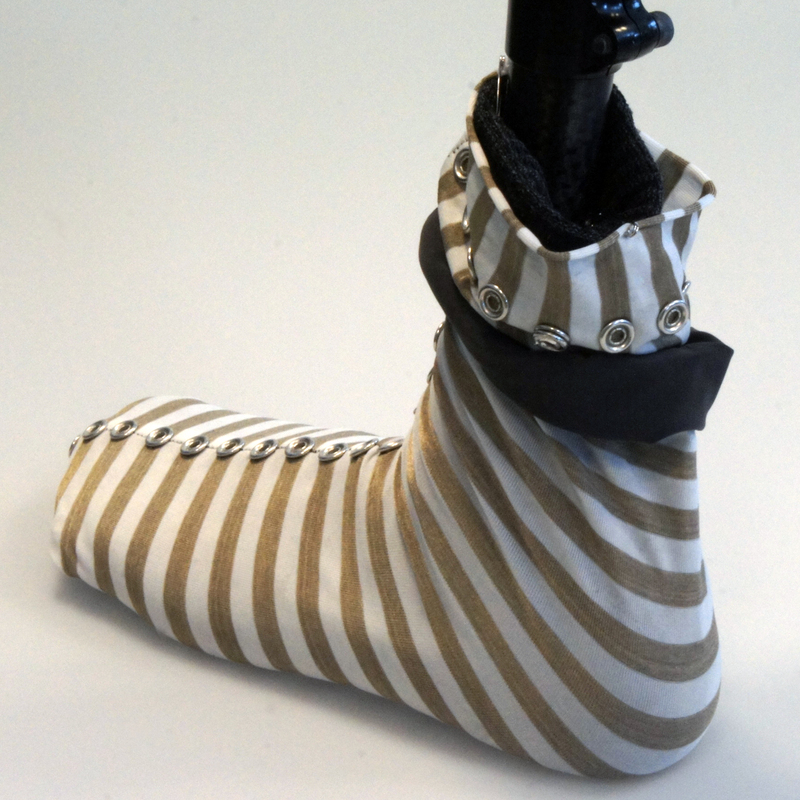 From this, we found that while prosthesis-users can already be fairly proficient at the task without sensory feedback, the sock may help to improve their sense of control (particularly for users who are new to having an artificial limb). Lastly, in the bend detection task, we assessed the detection accuracy of our knee-guard implementation. We found that a textile approach has the potential to provide bend information with a fairly high degree of accuracy so long as it is fitted well to the prosthetic leg. At present, many prosthesis-users rely on a wide variety of prosthetic-limbs which lack sensing abilities. In the course of this project, we learned that there is an interest and diverse range of sensing need amongst these users. 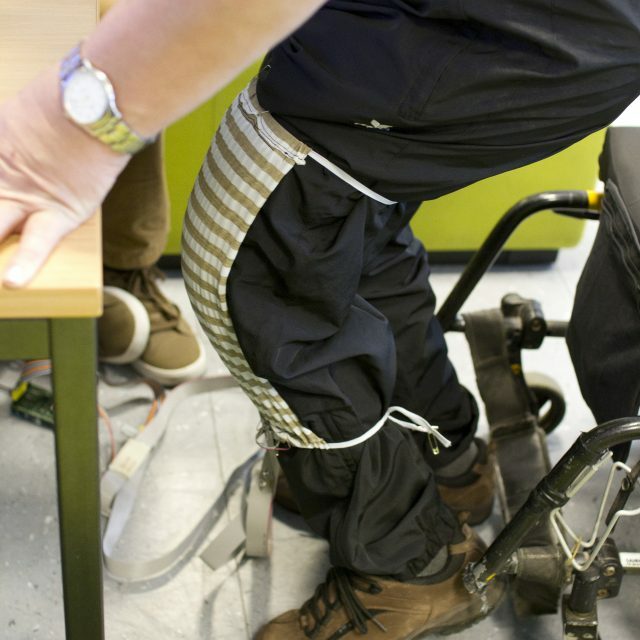 In the development and testing proCover, we illustrate that smart-textile wearables are a promising approach for the retroactive and sensory enhancement prosthetic limbs which can lead to an improvement of the quality of life for those living with amputation. J. Leong, P. Parzer, F. Perteneder, T. Babic, C. Rendl, A. Vogl, H. Egger, A. Olwal, and M. Haller, 2016. "proCover: Sensory Augmentation of Prosthetic Limbs Using Smart Textile Covers," in UIST16: 29th ACM User Interface Software and Technology Symposium, Tokyo, Japan, 2016, pp. 335-346. Funded by the European Union, 7th Framework Programme FP7/2007-2013 under grant agreement No. 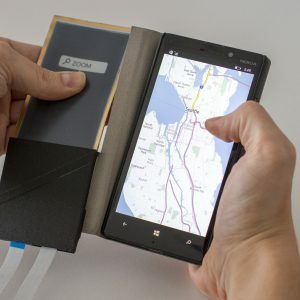 611104, and in part by NCBiR, FWF, SNSF, ANR, and FNR in the framework of the ERA-NET CHIST-ERA II (eGlasses) as well as from Google and BMW.